Oil on canvas. 27" x 33"
​​​​Born in Prague, Czechoslovakia, Jan Matulka became a leading modernist working with Stuart Davis to find a new type of Cubism based on distortion of forms. The totality of his work ranged from traditional to abstract, reflecting the changes in the art world of 20th century America. In 1907, he came to the Bronx, New York where he had a poverty-ridden childhood with a mother who tried to raise a family by herself. From 1908 to 1917, he studied at the National Academy of Design, and in 1917, received the first Pulitzer Traveling Scholarship with which he traveled and painted in the Southwest and Florida. 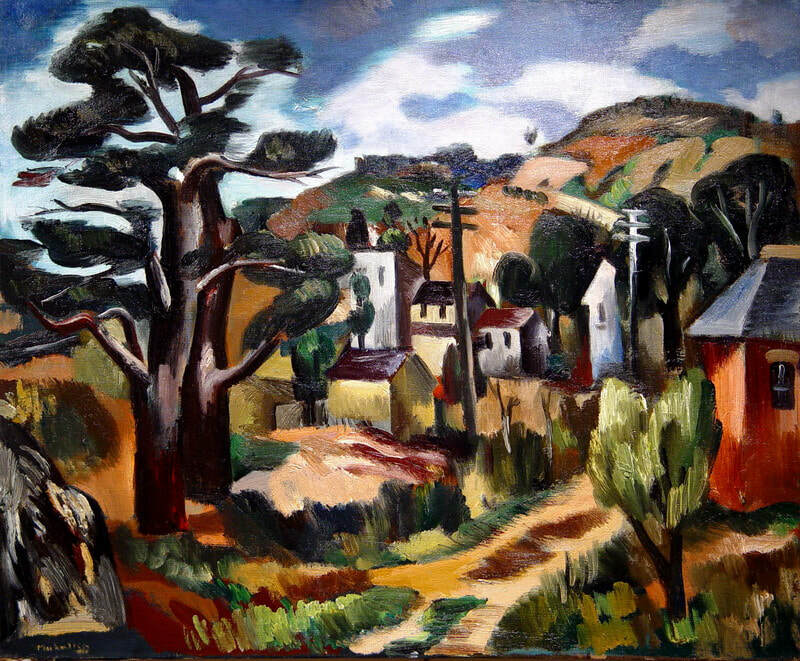 His work from this period showed a turning towards a more abstract style, replacing his earlier realism. In 1919, he first went to Paris where he was exposed to Cubism, and his painting after that seemed always to carry that influence. By the late 1920s, he was sharing a studio in Paris with Stuart Davis, close to other modernists including Alexander Calder, Isamu Noguchi, and Morris Kantor. Matulka returned to New York on a scholarship from the National Academy. In 1926, Katherine Dreier arranged his first important one-man exhibition at The Art Center, 65 East 56th Street in New York. From 1929 to 1931, he taught at the Art Students League where he inspired emerging modernists. Around this time, he and Stuart Davis were experimenting with their own version of Cubism. In 1931, Stuart Davis arranged a showing of his own work at the Art Students League along with the work of Matulka, John Graham and Arshile Gorky, which began a professional friendship between the four. In 1979, a retrospective of Matulka's work opened at the Whitney Museum of Art, and in 1982 an exhibition of works donated by Lida Matulka was organized at the Solomon R. Guggenheim museum in New York. In 1995 a one-person exhibition was organized by the Thomas McCormick Gallery in Chicago and from 2004-2006 The Global Modernist exhibition traveled to six venues. Matulka exhibited his paintings extensively throughout his career. His works are included in the collections of the Pennsylvania Academy of the Fine Arts, The Carnegie Institute, The Smithsonian. The Whitney Museum of Art, The Metropolitan Museum of Art and the Guggenheim Museum, among others.